The bucket or funnel pattern is similar to the bowl pattern with one variation. 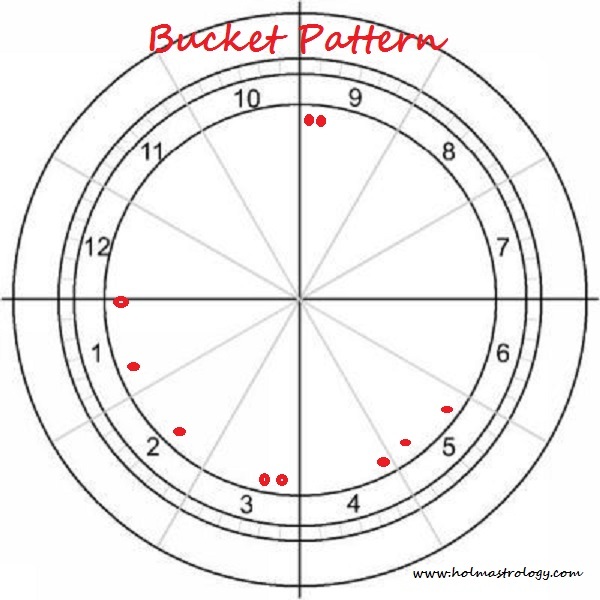 The bucket Pattern will have a planet or 2 planets that are closely tied into a conjunction removed from the bowl at least 30 degrees but preferably closer to 90 degrees away from the bowl. The separated planet(s) should oppose the centre of the bowl pattern. This configuration only comes into play when the central planet in the bowl positioning has this opposition from the opposing planet(s). 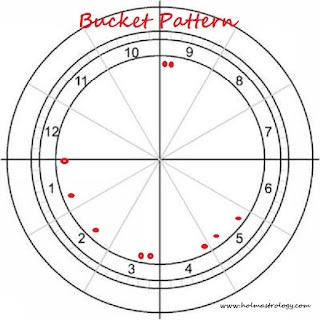 Individuals with this bucket pattern pronounced in their birth chart will funnel their energies through the handle of the bucket. The handle planet(s), its sign and house position will signal the energies that this individual applies most often. A person with this configuration is comfortable using these energies and will personify this expression when seeking gratification and fulfillment in their endeavors. The energies can differ significantly depending on the planet or planets involved in the equation. For example, the energies will be used in a completely different manner if the energies were linked to the planet Saturn than if the energy was attached to let’s say Mars and Uranus in conjunction. Those with Saturn in this opposition would be very comfortable expressing their need for the fulfillment of their plans using a more structured and disciplined approach. Those with the conjunction of Uranus and Mars would be ready and willing under most conditions to move freely into something new without too much deliberation or preplanning. The house position would determine what area of life would be involved. If, for example, this was a tenth house position, then the Saturn individual would pursue their career options with a certain amount of hesitation and prepare for their objectives in a very steadfast manner. The individual with the conjunction would push rather unhesitatingly, headfirst, without much reserve into these personal objectives. These individuals would be willing to bend, if need be, with the transition of their motives while those with Saturn would not bend easily with the flow of things. The Saturn individuals, however, would offer a more structured approach that perhaps would be better received by those in positions of authority.